Did you know that Crystal Cove State Park is home to a Marine Protected Area? 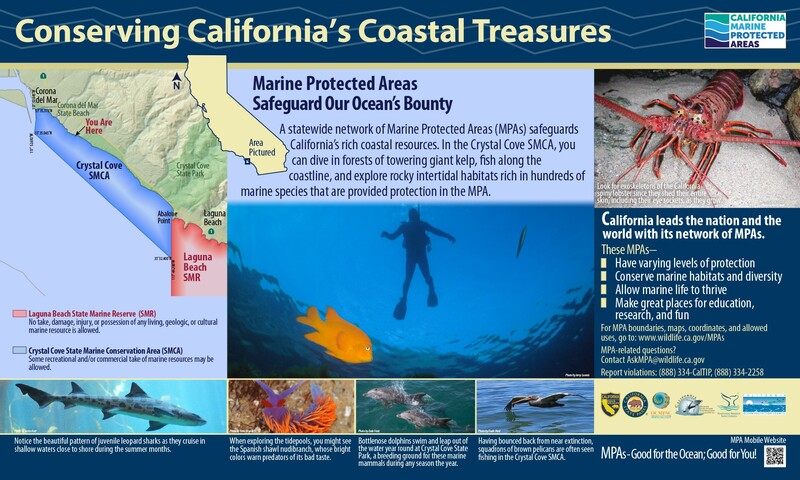 MPAs are regions along the California coastline that have been granted specific protections in an effort to preserve marine ecosystems. MPAs were created as a result of the Marine Life Protection Act (1999), which sought to conserve and protect both marine life and habitat through education outreach, research opportunities, and a well-managed network of MPAs. Crystal Cove State Park’s MPA is a State Marine Conservation Area or SMCA, which allows for limited recreational and commercial take. Absolutely no take is allowed from the tidepools. A healthy network of MPAs will encourage restoration and resiliency of habitat for marine life and better strengthen our marine ecosystems against growing environmental impacts.